So, have you been wondering if smartwatches can be worn as a fashion accessory? There are plenty of smartwatches that will specifically appeal to women and girls. When they first came out sometimes the watches did not fit small wrists, or the watches looked bulky with large straps. I just wanted some stylish designs that emphasized femininity. Well, the time has passed, and such gadgets have appeared. We have made a list of the top 10 smartwatches for women and have identified their important features. The buying guide at the end will also help you when choosing. 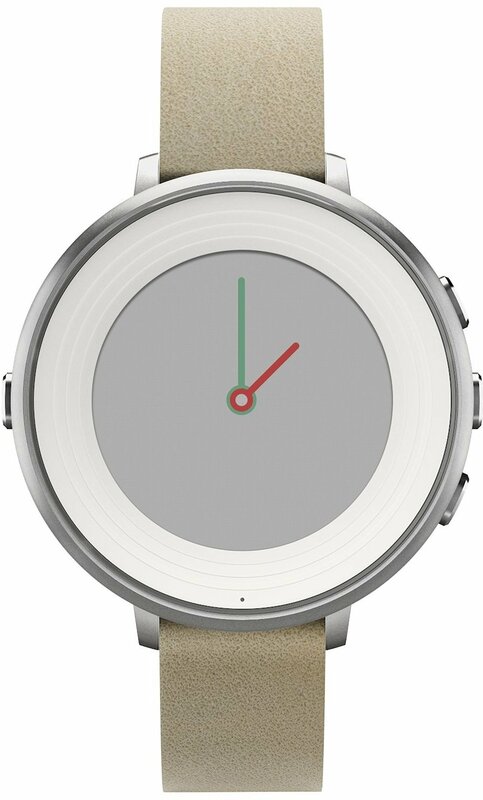 If you are looking for smartwatches for a small wrist, then you will like the Pebble Time Round. The first impression will surprise you. The watch is thin and practically weightless. Its thickness is three times less than that of the Apple Watch -an absolute record among all smartwatches. Because of this they are better suited for a thin wrist. The strap that comes with the watch is made of genuine leather and its thickness is only 14 mm. The straps can also be replaced very easily. However, for this, you need to buy only those made specifically for Pebble smartwatches. The body is made of stainless-steel Marine Grade. It doesn’t really conduct heat and works well in water. Its IPX7 waterproof rating suggests that a short-term dive to a depth of 1 m is allowed. However, the developers do not recommend often exposing the watch to water as the leather strap can deteriorate. First of all, I would like to note the speed. The clock is very fast, the animation is smooth and there are no delays at all. Notifications come in sync with the phone. The clock is synchronized with both iPhones and mobile devices on the android. They show incoming call notifications, messages and reminders. There is also a history feature where you can see what events or meetings have already taken place. More and more applications are becoming available for watches. You can use Uber, see the bus schedule, listen to music and more. The application “Health” is a fitness tracker that very accurately determines the number of steps taken and monitors the body’s state during sleep. It works without third-party applications, has synchronization with Apple HealthKit and integrates into most dials. A few words about the charging. It can last 2 days without recharging, but sometimes this time increases to 3 days, depending on use. It is noteworthy that it takes only 15 minutes to charge! During this time you can wash the dishes or take a shower. And now about the weaknesses of this watch. Yes, the strap is made of real leather, but it is so thin that after a month of use it cracks and looks cheap. We recommend that you buy a silicone strap for Pebble. It lasts longer and you can choose different colors. A color display is installed in the Time Round, which operates continuously. It looks beautiful, but the colors are rather dull. In order for you to see something on it, you need to put the watch under good lighting or turn on the backlight. To summarize, the company tried to do everything possible to offer the market an attractive device and released the Pebble Smart Watch The result is a watch with good features and a stylish design that women will really want to wear and not take off. What comes to mind when smartwatches are mentioned? Of course, the Apple Watch! Apple Watch Series 4 is still recognizable but has a completely new design. The general structure of the smartwatch case remained without significant changes compared to previous generation models. The case has a square shape with rounded edges. However, it is different from its predecessors in that the display increased by 30%, which occupies literally the entire front surface of the case which I will speak more later. The frames of the screen are really narrow, one can say barely noticeable. The case itself has become thinner. The difference is only a couple of millimeters, so it will be noticeable only to those who used previous models of smart watches. Smart watches are available in four colors. Perhaps pink will be preferred, but the choice is yours. So, its key change is its display. Apple released two versions: with a case size of 40 and 44 mm. For comparison, previous models of smart watches Apple came with cases of 38 and 42 mm. The display of the 40-millimeter version has a diagonal length of 1.57 inches, 44-mm model -1.78 inches. The increase in the size of its display by 30% affected not only the appearance. The screen is now able to fit much more useful content. The display supports LTPO technology. It is responsible for increasing energy efficiency. Due to this, the screens consume much less battery power, which keeps the battery life at a higher level. A lot of useful data can be displayed on a completely new dial “Infographic”. Users of Apple Watch Series 4 will be able to install on it up to eight different extensions. This means that only by glancing at the smart watch the user will be able to see all the information he needs. Furthermore, the Apple Watch Series 4 is equipped with an advanced heart rate sensor with several new features. The sensor automatically monitors the user’s heart rate and warns if the pulse is too low for 10 minutes. Thus, the sensor can prevent cardiac abnormalities, including bradycardia. A special warning is also provided for cases where the pulse, on the contrary, is too high. But the main innovation of Apple Watch Series 4 in terms of monitoring the state of health is the ability to make an ECG. Just put your finger on the Digital Crown wheel. The operation takes only 30 seconds. The Series 4 updated the accelerometer and gyroscope features. The sensors of the new generation are not just better at tracking your activity their new key feature is the ability to sense if you fall. If you fall, the sensors instantly recognize this and a special fall mode will work. The screen prompts you to make an emergency call to the rescue service. In the event that the user does not respond to the alert within 60 seconds, Apple Watch will call the rescue service themselves, and also send a message about the incident to those close to you. 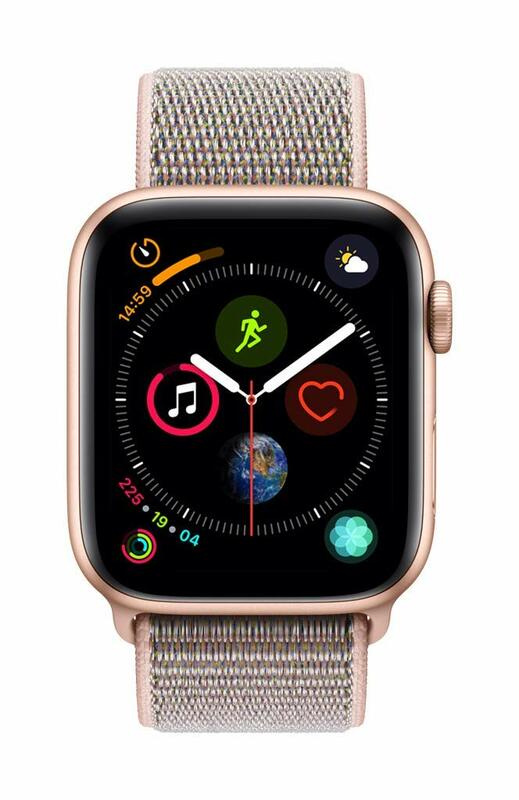 As for the speed of work, the Apple Watch Series 4 is equipped with a system on a dual-core 64-bit S4 processor. The chip provides the watch with rapid performance when performing any operations. The S4 processor is up to two times faster than the S3. For users, this increase in performance will be immediately noticeable. On Apple Watch Series 4, any applications are instantly launched, whereas on the smart watch of the previous generation, in many cases, you had to wait for a few seconds. Improvements are visible when interacting with the interface. Moving through the various menus takes place without the slightest hint of slowing down. But the wireless chip in the Apple Watch Series 4 has not changed compared to the Series 3. The clock, as before, has an Apple W3 chip. The gadget is equipped with support for Wi-Fi, Bluetooth 5.0, GPS, GLONASS, Galileo, and QZSS. The amount of internal memory the Apple Watch Series 4 has is 16 GB. Apple have produced thinner watched, but the battery life capacity gets higher. You can use it all day without the need for recharging. As for the drawbacks, the main thing it the price. However, that’s no surprise and it really justifies its price. Apple has managed to show what modern smartwatches are capable of. They are not intended to replace the smartphone. It is a companion that has enhanced functionality and health monitoring features, that can transfer notifications from your smartphone to your wrist. There are also design solutions for women to make them more pleasant to wear. -Location determination via GPS, GLONASS, Galileo, and QZSS. Quick performance when performing any operations. A large number of functions. Smaller battery life than others. If you want a smartwatch for an inexpensive price, then stop at Amazfit Bip. You will be pleasantly surprised. 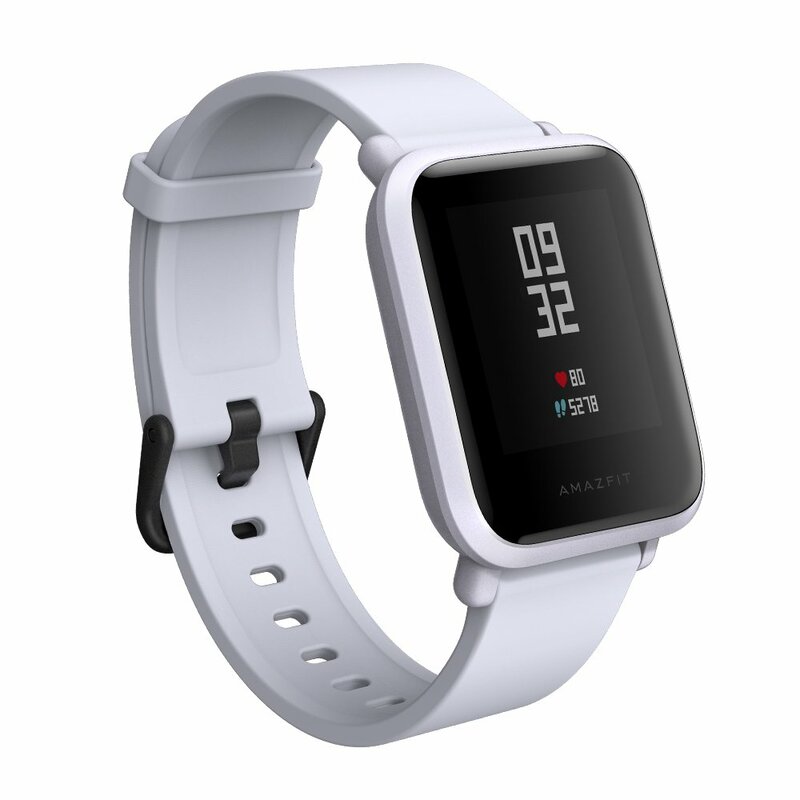 This smartwatch has the longest battery life on this list and supports GPS and if you compare Amazfit Bip and Apple Watch, then you will notice that they are similar to each other; a small square touch dial, single mechanical control button with a strap. One of the advantages of this watch is the reflective touch screen. The principle of operation of such a display is based on a polymer film capable of both reflecting and transmitting light -the more light that hits the matrix, the more contrasting (thus easier to see) is the image. In low light conditions, the built-in light is used as the light source. However, as this built-in light is not often used the watch has long battery life as usually most of the charge is consumed by the screen. A rounded Gorilla Glass 3 screen with an oleophobic coating is installed on top of the display. The finger slides easily, the prints are erased in one swoop, the response from the sensor is super. The body is made of scratch-resistant plastic. The company offers 4 casing colors: black, white, orange and dark green. With this watch, you can safely wash in the shower, as they are protected from moisture penetration according to the IP68 standard. Due to the small size and relatively small weight, they sit on the arm just fine. When you have it on it won’t dangle nor strain your wrist. And, in my opinion, it looks pretty cool on. But let’s take a look at the hardware. It performs all the functions that are in a usual fitness tracker: counts the steps, the distance traveled, calories burned and measures the heart rate using the built-in sensor. The clock menu has an alarm clock, timer, stopwatch, compass and weather forecast display for 5 days ahead. There are several sport features which can track your running (on the street or treadmill), cycling and walking. Since the watch is equipped with a GPS module, at the end of the workout you can see your route on the map. In addition, there are altimeter and barometer, which in turn will track the inclines while cycling or running. And of course, the Amazfit Bip can send you the notifications you receive on your smartphone. However, you cannot interact with them -just browse. With an incoming call, you can either reject or ignore it. But, wan to know the most important advantage of Amazfit Bip? The compact case fits within it a 190 mAh battery. If for example, you use it to track your exercise once a week with its backlight brightness on 10% and you receive 100 notifications per day, then it will work for 40 days without recharging. If you only use the time display, step counting, sleep monitoring, then the clock will work up to 4 months. As for the shortcomings, there are not many however we will still touch on them. For example, if you turn on the timer or stopwatch, you will see a flaw -the display does not show the current time, which brings some inconvenience. The alarm clock also cannot be set using the clock feature. A new alarm clock must be set from the phone, on the watch’s clock you can only turn it on or off. And finally, with Amazfit Bip you cannot control the music player on your smartphone. You will have to constantly reach into your pocket to switch the track or change the volume. Amazfit Bip Smartwatch is a worthy budget alternative to the Apple Watch. If you need a functional gadget for sports, and not for your status and image, you can safely choose this product. The drawbacks are more related to the accompanying software. They do not affect the performance of the model. The list of advantages and really useful functions, such as it being waterproof and the presence of an integrated GPS module, significantly outweighs them. Long working time without recharging. You cannot control the player on your smartphone. The low contrast of the display. For several years, Fitbit has been associated primarily with activity trackers. This Fitbit Versa model can do much more. This is a smartwatch and a fitness tracker combined. With it, you can store music for listening offline, track your workouts and it can last for several days without recharging. But first, let’s talk about the design. The touch screen on the Fitbit Versa is small but bright and highly detailed. It has nice colors and the visibility in the outside is excellent. Since this is an LCD panel instead of OLED, there is no ‘Always On Display’ function, unless you are tracking exercise. There are several color options; including pink. Replacing the strap does not require any special tools, but it is a rather painstaking process. The latches are small and it’s not so easy to deal with them. The case is made of aluminum, the screen is protected by Gorilla Glass 3. The back part is slightly convex, to ensure a better fit of the heart rate monitor to the skin without the need to tighten the strap. The watch is light and practically not felt on the hand meaning it won’t interfere when you go to bed, allowing it to easily track your sleep. This company is known for its accuracy in its sleep monitoring features in its products. It automatically determines when you fall asleep and wake up and determines the duration and quality of sleep. It uses a simple approach to displaying data which helps you understand your progress through comparisons with the average person of your age and gender. 24 hours a day, the heartbeat is monitored, steps are counted, and prompts are given when you need to move or stretch if you sit too long. The types of activity it monitors include running, cycling, swimming, tennis, yoga, and martial arts. Long walks around the city are automatically recorded in the journal under the guise of exercise. Sports such as football or basketball are not represented, but there is a general setting called “Exercises” that is suitable for them. When the activity is complete, information about calories burnt and heart activity is given. What about its smart features? 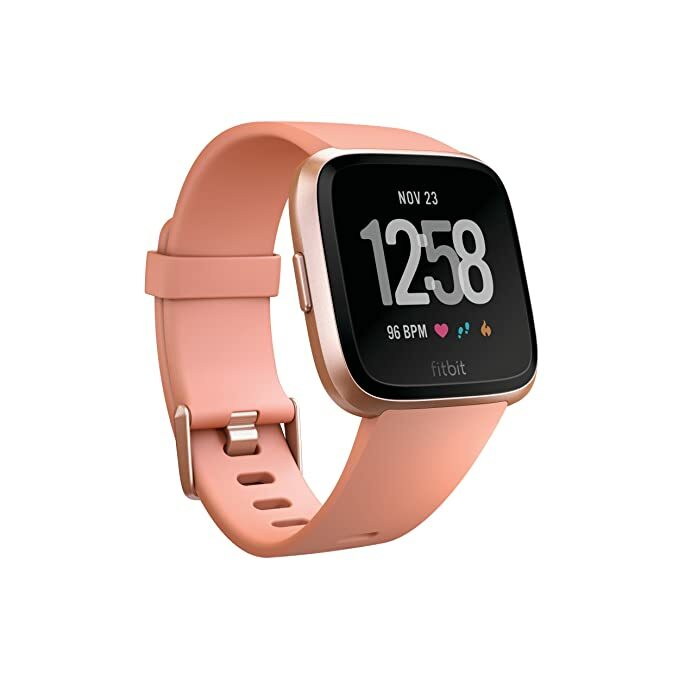 Fitbit Versa can store music on the internal memory and play through Bluetooth headphones. There is more than 2 GB of space available; enough for more than 300 songs. But there is a catch. There is no compatibility with services like Spotify and Apple Music. Only two music streaming services are presented Deezer and Pandora. You will also need a paid account. You can copy MP3 files through a computer. Another new feature is female health. To use it, you will not have to install any additional applications, all this is in the standard Fitbit application. Notifications from smartphones can be displayed, a powerful vibration means you will not miss them. You can filter notifications so that some less important ones will not distract you. At the same time though, you cannot react to these notifications, you can only respond from a smartphone. We recommend getting the Fitbit Pay app. With it, you can use contactless pay via your smartwatch. Currently, it is supported by 34 banks in 14 countries. As for its battery life, with the automatic brightness level set and with notifications enabled, it is possible to last for 4 days which surpasses the capabilities of the Apple Watch and watches on the Wear OS platform. Use of music and the screen during exercise significantly reduces the time. To recharge, the watch is placed on a small docking station, which looks quite awkward, but you can charge the watch even in your backpack. From zero to 100%, the watch charges in about two hours, in 30 minutes it can last a full day. There are of course disadvantages. One of them is the lack of built-in GPS. During exercise, it will not be possible to obtain accurate data about the distance, speed or pace that other devices with a location tracker can offer. To solve this problem, the developers have made it possible to synchronize the smartwatch with GPS on your smartphone. It can also be said that the work of some functions can slow down, and the software cannot be called perfectly optimized, the presence of dials and applications is also not impressive. However, the developers are working on the clock and are in the process of releasing updates. So, we can say that Fitbit Versa is a hybrid of smartwatches and fitness trackers. However, it is primarily focused on users leading a healthy lifestyle. It is good in terms of external performance -the Versa has a cool design and small size. On the other hand, if you are not at all interested in the fitness component and you are wanting more of a smartwatch for its daily functionality, then Versa will probably not be the best choice for you as it still needs to sharpen these other functions. The functions of the fitness tracker work well. Its syncing with smartphones is unreliable. In 2018, Samsung launched its Galaxy Watch line, which consists of two models, differing in dial size – 42 and 46 mm. We shall be considering the smaller one. This gadget has the design of a classic round mechanical watch, complemented by a bezel -a swivel ring around the dial. The swivel rim is very convenient, with its help you control the clock. It is ribbed, so there are no accidentally interferences, even if you are wearing a long-sleeved shirt and quickly move your arms while walking. On the right are two side buttons which you use for the necessary functions. You can use the swivel ring when a call appears on the menu to answer or decline it. The latest version of the software even added a ticking sound for the clock’s second hand (you can turn it off if you wish), this creates a complete illusion that you have a normal watch. As usual, the watch has a full variety of dials and settings, but more on that later, for now, let’s focus on the screen. The glass is resistant to everyday scratches -it is very difficult to damage. Furthermore, the picture looks bright and clear. You can also turn on the increased sensitivity of the screen in the menu, so it will allow you to use it with gloves. The AlwaysOn Display function is supported, meaning that the screen can operate continuously. A clock with a permanently on the screen can easily last for more than a day, if the night mode is on, then two days. This watch works great with any Android-smartphone, and with iOS. With the latter, however, many functions are limited due to the limitations of the system itself, so it’s impossible to fully realize the potential of the iPhone. To go to the Samsung Apps you need to log in to your Samsung account. You can search by category, or rely on the proposed lists, for example, necessary or recommended applications. You can easily choose the dial you like via Galaxy Wearable or on the watch itself. In the “Notifications” section, the notification indicator on the clock can be activated, as well as setting up all applications whose notifications will be displayed on the Galaxy Watch screen. To use the Samsung Pay payment service, you first need to install the appropriate application. Unlike the Gear S3, the Galaxy Watch no longer supports the Magnetic Secure Transmission technology. It only supports NFC. For emergencies, the program settings provide for sending emergency alerts to selected subscribers, while the sender’s location will be monitored for an hour. In addition, you can use the paired smartphone to search for it if lost. It will produce sound and vibrate, and you can connect its geolocation. Sensors such as an accelerometer, gyroscope, barometer and heart rate monitor, allow the Galaxy Watch to collect a variety of data about its wearer. This can be associated with both physical activity and general well-being, which the well-known Samsung Health application successfully monitors. With the help of the Galaxy Watch, sleep is easily monitored, including the REM phase. This, in particular, will help to know how much you need to rest at night in order to work productively during the day. However, it is still inconvenient to fall asleep with a rather bulky watch on your wrist. For this purpose then, the usual fitness tracker is better suited. The convenience of the watch lies in the fact that you can watch notifications without getting the phone out of your pocket, you can answer calls and talk using it. You can do it using the watch’s own SIM card or via Bluetooth. This makes the Samsung Galaxy Vach one of the best standalone smatrwatches. With regard battery life, the 42 mm model works for around 3 if the screen is not constantly on. If you turn it on, the duration drops to 2.5 days. It does not use GPS, which is known for quickly consuming energy. As for the weaknesses, as mentioned earlier, this smartwatch does not sync well with the iPhone. That is, it can do it, but not all the functions will successfully work. Another downside is Bixby – this voice assistant does not work well. Overall, we can say that this Galaxy Watch is the most advanced model from Samsung. They offer elegant and user-friendly design, a set of sensors for sports and activity tracking, and standard watch functions. There is perhaps a lack of applications, but many can do without them. The Galaxy Watch is a good value for money and has the basics. If you lead a sporty lifestyle and love fashionable gadgets, this Galaxy Watch will be an attractive acquisition. A large set of sensors for sport activity. The voice assistant has flaws. Kate Spade New York is a famous American fashion brand. It is for those who choose fashion, style and high quality at affordable prices. However, Kate Spade is not just an accessories and clothing company. They now also produce stylish smartwatches for women. 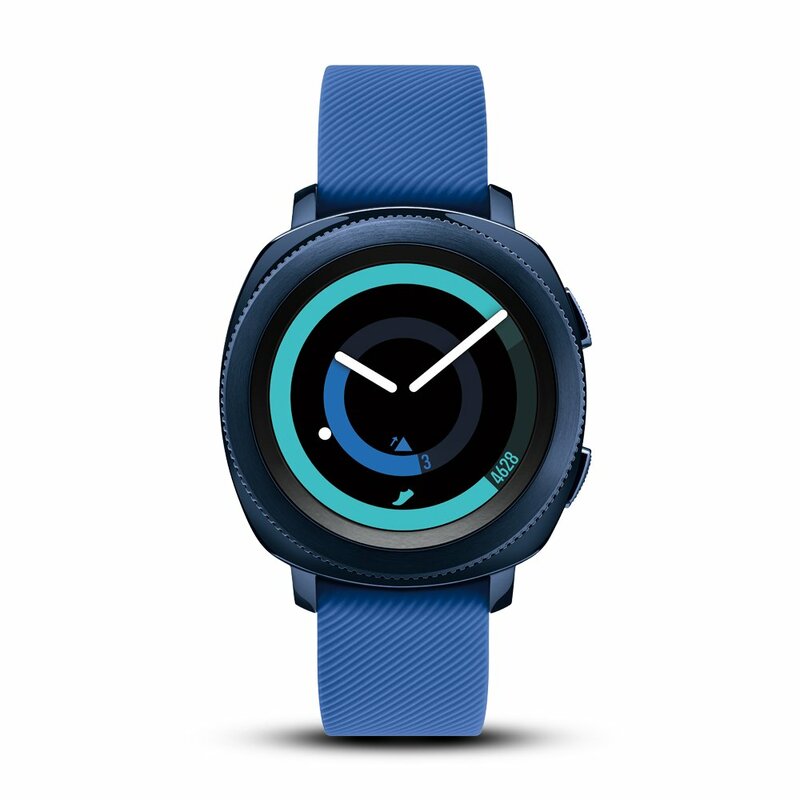 These women’s smartwatch has a feminine scalloped edge around the face, which makes it really stand out in the market. As for the size, the watch cannot be called small. The case diameter is 42 mm. However, due to the fact that the watch is thin, they are ideal even for small wrists. It is worth noting it weighs 8 ounces meaning it will barely be felt on the wrist! Kate Spade offers a choice of 2 color options: rose gold-tone and silver gold-tone. Furthermore, you can choose either a silicone strap or a bracelet that match the color of the watch. You can also customize the watch face. There are several design options and you can make changes to each one as you like. But that’s not all. Using the application on your smartphone, you can choose the color scheme of the dial, which you can, therefore, use to match with your clothes, jewelry or handbag. The clock can also be used as a fitness tracker, a sleep quality monitor and a pedometer as well as counting the number of calories burned and distance traveled which are all standard smartwatch features. Moreover, though, the watch also has the feature of voice activation. You can say what you want to it to do and the clock will do it. This feature works with almost no errors. As for notifications from your smartphone you can use the iPhone or Android. 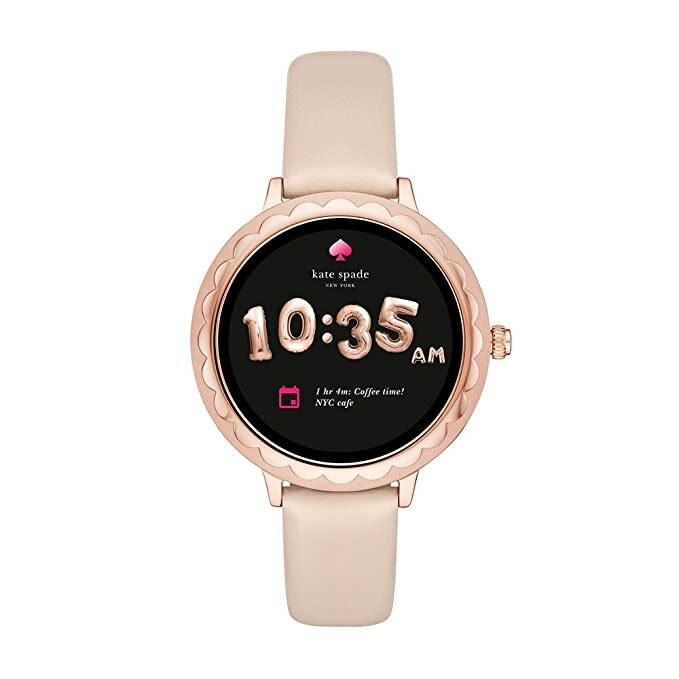 However, this smartwatch will be better for women with Android smartphones as in this case, you can respond to messages and calls on your Kate Spade watch. However, if you pay attention to the battery life, then you may be disappointed. It lasts only about 14 hours, meaning you will have to charge it every day. In general, if you do not look at the battery life issue, Kate Spade smartwatches are a good buy for women who always want to be stylish. Thanks to the beautiful design and flexible setting of the dials, you will not remain indifferent to this watch. Not all features work with the iPhone. Samsung is gradually improving smart watches, and this particular model, the Gear Sport, as a sports watch, is specifically designed for those who lead an active lifestyle. The model is available in two colors -black and dark blue. The difference in the color of the case is not striking but the watch looks good on the wrist. It weighs 2.3 ounces, which is a good weight for watches, not too light nor too heavy. You will feel if it flies off your hand, whilst on the other hand, there is no discomfort from its weight when you wear it all day. The straps are 20 mm, and it comes in small and large. The blue case comes only with the blue strap, whilst the black one comes with the black one. The clasp is good, the strap is soft. In the water, it is necessary to fasten the watch more tightly because otherwise, the measurement of the pulse will be inaccurate. The case is made of 316L stainless steel, it is hard to break or scratch it, the watch is assembled with quality. Please note that, unlike previous models, Samsung abandoned the IP68 marking. To emphasize the difference, the case indicates “Water Resistant 50 M”, the description explains about 5ATM. In reality, this means that you can swim with the watch, dive to a shallow depth, but do not dive with an aqualung since performance, in this case, is not guaranteed. The readability of the screen in all conditions is excellent. You can set the watch to turn on notifications or to turn on the screen’s AlwaysON Display mode, meaning it will always work with dimmed brightness, and when you raise your hand, it will work at full capacity according to your setting. You will be able to achieve your desired version of the watch in its different modes, thanks to the selection of dials, and their huge number, both free and paid. And now let’s touch on its general functioning. Notifications appear on the watch in a familiar manner, plus it also has Samsung Health which can measure such things as steps and pulse. For those involved in sports, it will be interesting to see the training options. For example, you can find in the menu not only the usual running and cycling monitoring options but also pilates, weightlifting, and swimming. In Samsung Health there is an interesting feature where you can compete with friends, who among you will walk the most steps. On the watch also, there is a widget that shows your progress -an interesting and motivating thing. In addition to steps and distance, the watch also counts how many floors you have walked up and can measure incline. A few words about Samsung Voice. The Samsung Voice feature, unfortunately, works only with Samsung phones, although the watch can be connected to any Android-smartphone or iPhone. On the Brightside though, the quality of the voice recognition is good. However, on a busy street or in a crowded room the watch’s microphone will respond to extraneous sounds, and therefore you can only really use the Samsung Voice feature in a quiet area, as in other cases there will be many false alarms, or it simply does not work correctly. Samsung Pay only works with NFC. When you turn on Samsung Pay, you will have to set up an additional passcode, which somewhat diminishes the whole idea of fast payments, since you will have to dial a four-digit PIN. Separately, I note the presence of hardware GPS and Glonass. That is, the watch has full navigation, without a smartphone companion. Navigation works on Here maps, everything is quite simple, including directions (on foot, by bike or by car, with an approximate time on the road given). Another interesting point is that in addition to GPS, this watch also has a hardware barometer and an altimeter, which are used in sports applications (the slope, distance traveled). It can also locally predict the weather. The speedometer shows your current speed. The SOS function allows you to transfer your coordinates and a message to specified numbers, which was not on previous models. Also, your location will become available to your emergency numbers. Music can be controlled directly from the watch, while you can also upload your songs. If you wish, you can connect a wireless headset directly to the clock, then you will not need a phone to listen to music. On the smartphone, you can install the Gear Manager, which allows you to fully customize your watch, and from there, fully access the app store. What about battery life? Well, the built-in Li-Ion battery has a capacity of 300 mAh. On average, these clocks work up to 2 days in the AlwaysOn Display mode. In the off-screen mode and with a moderate number of notifications, it will last from 3-5 days. Charging lasts almost 2 hours which is pretty average. Year by year, the number of applications for these watches are growing-there are around 10,000. However, there are almost no apps that are really needed as everything is already in the clock initially. Going onto the app store can often be chaotic! 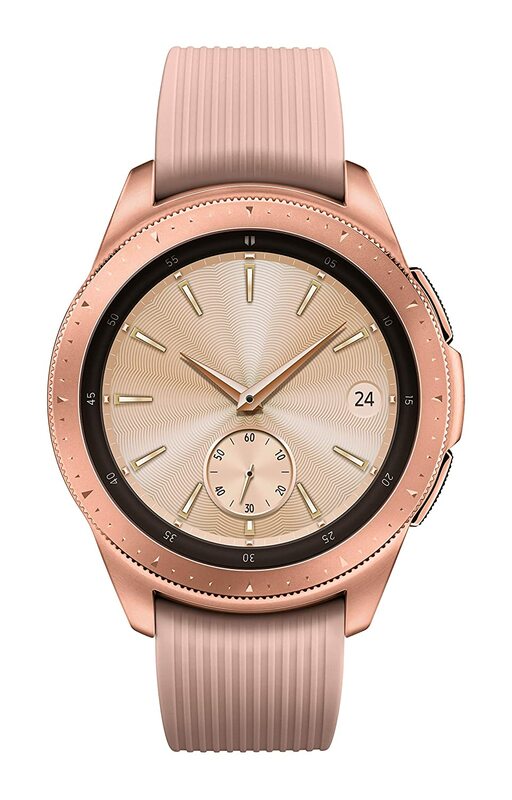 However, for the full functionality of this watch, it is required that several proprietary Samsung applications and processes be launched on the phone. They consume a lot of energy and resources. Also, not all of them can work on every phone and because of this, you can lose the functionality of these smartwatches. Generally speaking, this watch is a good gadget for its price and will be of use to women who engage in physical activity, particularly swimming – although its use does not end here. Samsung Voice only works with Samsung phones. The Q Venture HR modification should interest women with its design. Engineers sought to give the watch an elegant design and provide it with rich functionality. Smartwatch has a pleasant minimalist design with shades of pink and gold. The body material is made of stainless steel. The diameter of the dial Q Venture HR is 40 mm. Bracelets and leather straps are 18 mm wide and can be replaced by others. A gadget is built on the basis of Qualcomm Snapdragon Wear 2100. The software interface is Google Wear OS. The main feature of the watch is its good customization. You can customize the interface and clock faces. You can even use photos from Instagram or Facebook. Watches can interact with smartphones that have Android version 4.4 or higher or iOS version 9.3 or higher. There are GPS location tracking, microphone, light sensor, altimeter, accelerometer, a cardiac activity sensor, gyroscope and an NFC chip for payment. Developers promise that on a single charge the watch can work up to 24 hours, which of course depends on the amount of use, but this is slightly less than other watches out there. There may also be problems with the leather strap as it can quickly deteriorate. 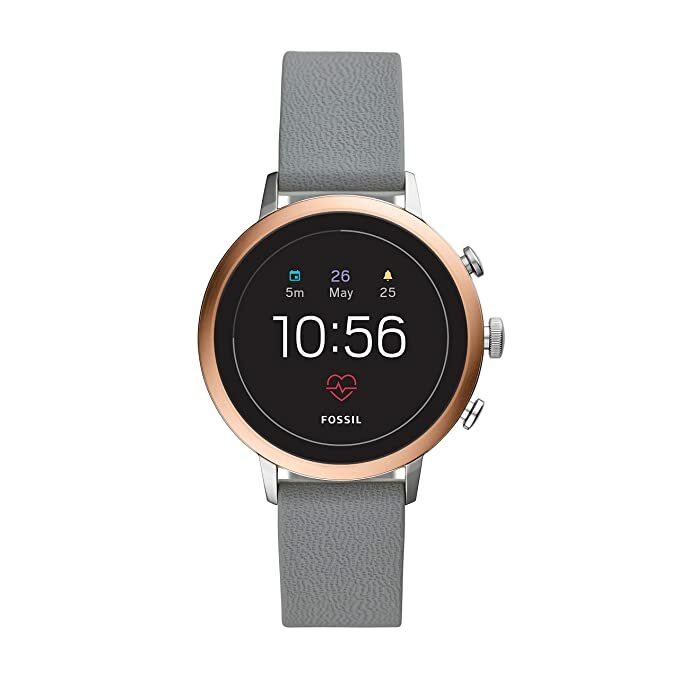 Fossil can be considered an average smartwatch for women. It has the necessary functions for smartwatches at a decent price. The watch has a classic design and small size that goes well with thin wrists. LETSCOM Fitness Tracker is suitable for women who want to monitor their health and workouts for a small price. It has some useful features of a smartwatch. But first things first. 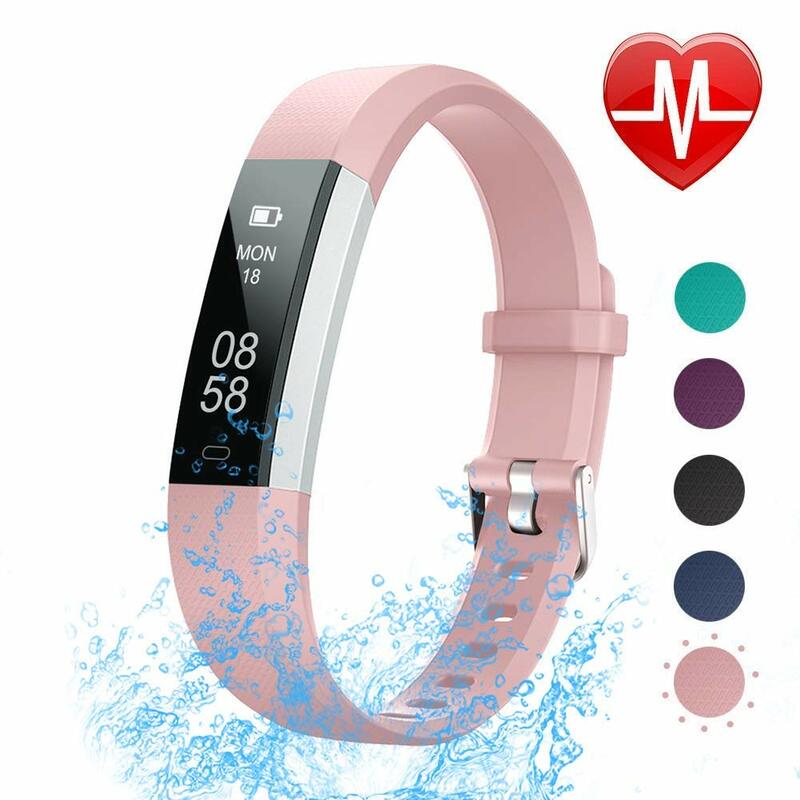 There are five colors to choose from and the watch itself is small and can be customized so that this fitness tracker will suit even children. The activity tracker itself is small and light, which is a benefit of such gadgets. However, it cannot be called waterproof. Nothing will happen if you wear it in the rain, but if you submerge it in water, it will probably break. How does this fitness tracker monitor health? It has all the standard functions of similar devices: heart rate monitoring, activity tracking, and sleep tracking. There is also a function that reminds you to exercise or take a walk when you sit for a long time. Despite the cheap price, these functions work quite accurately. One of the features of LETSCOM is the presence of phone call or message notifications that your smartphone receives. The main feature is that it also works with social networks and instant messengers. To do this, you need to synchronize your Android-smartphone or iPhone and the fitness tracker. There is also an alarm clock and a reminder of planned activities. A special feature is that the fitness tracker does not scare you with a strong vibration or a thick sound. You can customize the level. Developers claim that the data is stored only a week, so you need to synchronize it at least 1-2 times a week. As for the battery life, you need to charge the fitness tracker every four days. Regarding the disadvantages, there are problems when synchronizing with your smartphone. The bottom line is that this is a product of a Chinese company and there are some problems with the English language when setting up the gadget. Also, if you want to constantly receive notifications on the fitness tracker, you will need to keep Bluetooth on all the time which puts a lot of pressure on the battery. Let’s summarize. So, if you are looking for a fitness tracker for a child or for yourself, then you will not find a cheaper option than LETSCOM, which will work well. Yes, there are some flaws, but they are tolerable for the price. The tracker consistently performs all the functions that such a gadget should perform. Sometimes there may be problems with synchronization. 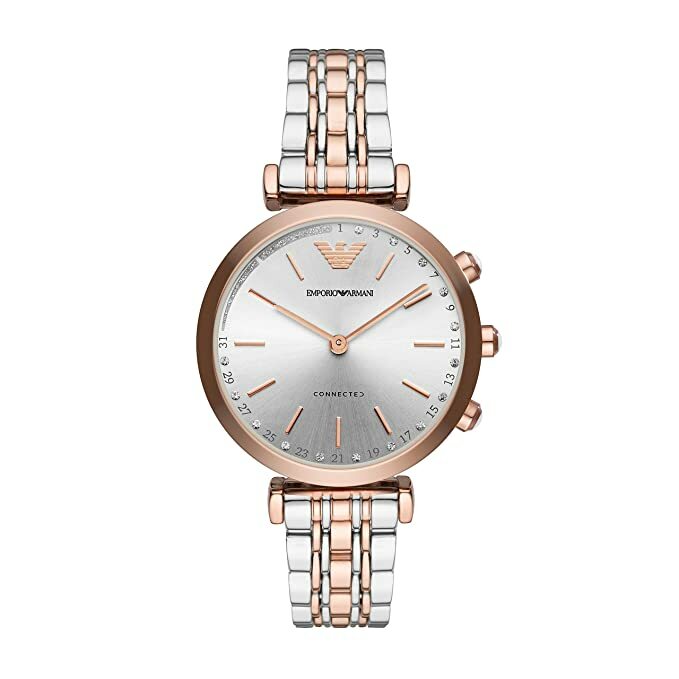 If you are wanting a designer smart watch from a fashion brand, then look at Emporio Armani. I think the pink model, with a pink and silver metallic bracelet, consisting of alternating polished and matte links will be popular with women so we shall consider this model. On the back of the device is the Emporio Armani company logo. On the sides of the watch, there are also 2 additional buttons to control the clock, which is often not the case with other smartwatches. It looks like an expensive classic watch. Interestingly, its peculiarity is that there is no touchscreen, only a beautiful dial. Thus, it can be called a hybrid clock. It can be connected to your smartphone and then the watch performs some smart functions. There aren’t so many, but it has the most basic. Smart watches calculate the distance traveled, calories burned and the number of steps. These indicators you can see through the application. If you receive a message on your smartphone or call, then the watch notifies you with a vibration. It is also possible to control the music on your smartphone through the buttons on the clock. Another feature is that this watch does not require charging. Another difference of this device in comparison with others available on the market is that the battery life reaches 6 months. When it has been exhausted, you just need to change the battery. This smart watch does not have a large number of functions, which may not be ideal for some people. You still need a phone to listen to music for example, and you receive a notification about the message, but you cannot read it. I would say, the main reason why you should buy this particular device is its design. The choice between watches comes down to external differences, an abundance of straps and bracelets, as well as user interfaces and loyalty to a particular brand. If you like the look of this watch and you are satisfied with its capabilities, then you should buy it. A large number of compatible straps. Some women have thin wrists. When choosing a smart watch, we paid attention to this aspect of the design. The watch should not be bulky, and the strap should not be large. All watches that are presented in this list meet these requirements. Another aspect of the design that we believe is significant is the appearance itself. There are so many to choose from; from subtle, stylish smart watches that match your outfit, to statement pieces that standout. We had to sift through a large number of reviews about each watch. We made it a priority to really study customer reviews. Also, we had members of our team who took a look themselves at some of the selected smart watches for women and they shared their experiences and thoughts. This guide presents to you a variety of smart watches, each with their own personal characteristics and relevant differences. You will not find two watches that look alike. To choose your own watch, decide for yourself what is the most important aspect for you: price, functionality or appearance. Pay attention to the time it can last without a recharge. It varies from several hours to several days on different gadgets. Amazfit Bip has the longest running time among the smart watches on this list and is about 40 days. The body may be square or round. Also, note the ability to customize the display. Fossil Women’s Smartwatch has the best customization. You can use photos from your Facebook or Instagram profiles. Pay attention to the compatibility of the watch with the operating system of your smartphone. Most of the presented gadgets can be synchronized with both Android smartphones and iPhones. However, pay attention to the smart watches from Samsung and Apple as they will only work with models from their own company. Watches have different ratings of moisture protection and dust resistance. You can see what they mean here. Samsung Gear Sport is the most waterproof smart watch. With it, you can dive up to 50 m under water. Do you want to have a gadget with multiple features or a beautiful accessory? If you choose the first, then pay attention to the number of useful functions available on the gadget. First of all, there are functions that monitor your health and physical activity. Some smart watches even allow you to follow the progress of your workout. Each smart watch in this list can alert you to incoming calls or messages on your smartphone. Some have the ability to even respond to them. In addition, many watches have location support using GPS or GLONASS, the ability to pay with an NFC sensor, music control and voice control. Do Smartwatches need to be connected to a phone? Smart watches do not necessarily have to connect to the smartphone. First of all, they are used as an accessory. Connecting to a smartphone simply allows you to use more functions. How far away can my phone be whilst still being connected? The range depends on Bluetooth. It can reach about 33 feet in buildings. Can I make a call from a smart watch? With most smart watches you cannot answer or make calls. If you want to do this, then from the list above we recommend you Samsung Galaxy Watch.